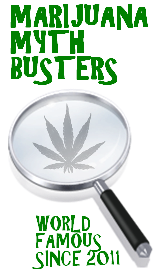 This entry was posted by Mythbuster on October 19, 2011 at 7:47 pm, and is filed under Marijuana Myths. Follow any responses to this post through RSS 2.0.You can leave a response or trackback from your own site. The billion dlloar crop is hemp, not marijuana. Same species for now, but hemp has virtually no THC and mostly CBD, whereas marijuana has mostly THC and virtually no CBD. Hemp was replaced by the synthetic chemicals, oil, and all other modern inventions . So the billions of dlloars made from the nonrenewables was literally stolen from the renewable hemp. Marijuana legalization would most likely increase violence by drug lords since once it’s legalized and everyone could grow their own, the money would disappear. The tax would only apply to selling it, but who would be buying when you could grow it yourself?We need to eliminate drug lords before legalizing marijuana, coca, and opium.